Your day-by-day itinerary now includes Fjord Tours as well as Bryggen. 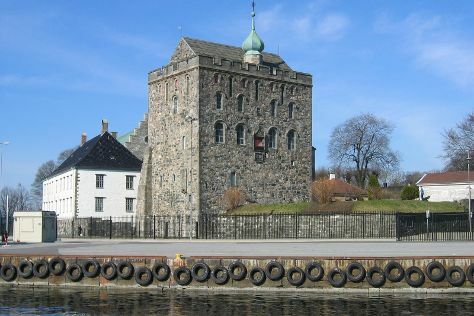 On the 2nd (Fri), catch all the local highlights with Fjord Tours, then contemplate the long history of Rosenkrantz Tower - Bymuseet i Bergen, and then take in the waterfront at Bryggen. Get ready for a full day of sightseeing on the next day: admire nature's wide array of creatures at Akvariet i Bergen. For traveler tips, maps, photos, and tourist information, you can read our Bergen trip itinerary builder. If you are flying in from Ukraine, the closest major airport is Bergen Airport Flesland. Expect a daytime high around 17°C in September, and nighttime lows around 10°C. On the 3rd (Sat), wrap the sightseeing up by early afternoon so you can travel to Flam. Nestled in a kingdom of mountains and fjords, the scenic village of Flam serves as a good base for exploring some of the most beautiful sights of Norwegian nature. Kick off your visit on the 4th (Sun): stroll through Flam Hiking AS, then browse the exhibits of Otternes Bygdetun, then enjoy breathtaking views from Stegastein Lookout, and finally take some stellar pictures from Stegastein. 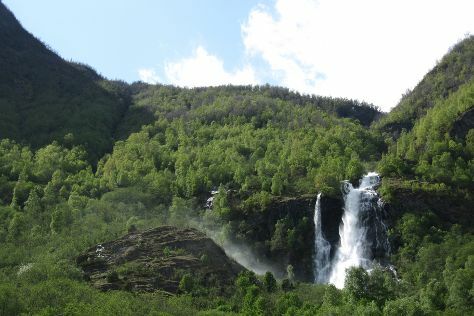 Get ready for a full day of sightseeing on the 5th (Mon): explore the landscape on two wheels at Rallarvegen, then examine the collection at Flaamsbana Museet, and then take in the dramatic scenery at Brekkefossen. To find photos, where to stay, ratings, and other tourist information, refer to the Flam trip planner. Traveling by combination of train and bus from Bergen to Flam takes 2.5 hours. Alternatively, you can drive; or take a bus. Finish your sightseeing early on the 5th (Mon) so you can travel to Kaupanger. Kaupanger is a village situated along the northern shore of the Sognefjorden in the municipality of Sogndal in Sogn og Fjordane county, Norway. Kick off your visit on the 6th (Tue): admire the masterpieces at De Heibergske Samlinger, Sogn Folkemuseum and then take in the architecture and atmosphere at Kaupanger Stave Church. For maps, where to stay, reviews, and tourist information, use the Kaupanger itinerary builder. Do a combination of car and ferry from Flam to Kaupanger in 1.5 hours. Alternatively, you can do a combination of bus, car, and ferry. In September, daytime highs in Kaupanger are 13°C, while nighttime lows are 7°C. Wrap up your sightseeing by early afternoon on the 6th (Tue) to allow time for travel to Geiranger. Surrounded by pristine nature, the scenic village of Geiranger serves as a gateway to some of Norway's most famous landscapes. Kick off your visit on the 7th (Wed): take in the dramatic natural features at Geiranger Fjord, take some stellar pictures from Flydalsjuvet, then make a trip to Fossevandring, and finally take in the dramatic scenery at Seven Sisters. 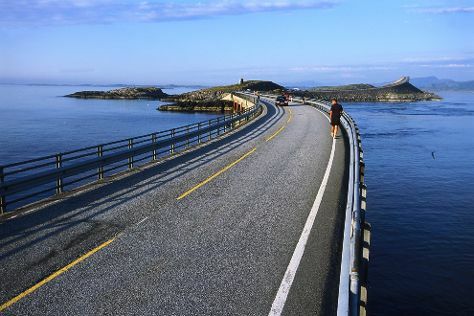 Get ready for a full day of sightseeing on the next day: take a memorable drive along Ornevegen - Ornesvingen. 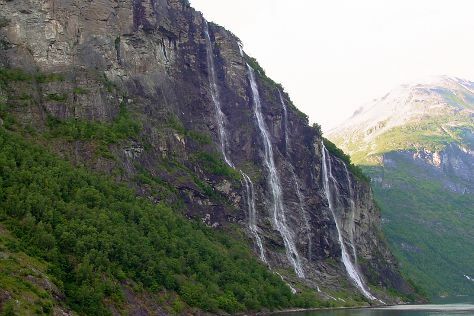 To see ratings and more tourist information, refer to the Geiranger itinerary builder. Traveling by combination of car and flight from Kaupanger to Geiranger takes 3 hours. When traveling from Kaupanger in September, plan for a bit warmer days and about the same nights in Geiranger: temperatures range from 17°C by day to 9°C at night. Wrap up your sightseeing by early afternoon on the 8th (Thu) to allow time for travel to Averoy Municipality. Kick off your visit on the 9th (Fri): head outdoors with Atlantic Road. For traveler tips, reviews, other places to visit, and other tourist information, you can read our Averoy Municipality itinerary planner. Traveling by combination of car ferry and car from Geiranger to Averoy Municipality takes 5 hours. Wrap up your sightseeing by early afternoon on the 9th (Fri) to allow time for travel to Alta Municipality. On the 10th (Sat), explore the stunning scenery at Alta Canyon and the Alta Dam, take in the architecture and atmosphere at Nordlyskatedralen, then take in the architecture and atmosphere at Alta Church, and finally explore the galleries of Alta Museum - World Heritage Rock Art Centre. To find where to stay, traveler tips, reviews, and other tourist information, use the Alta Municipality online itinerary creator. You can do a combination of taxi and flight from Averoy Municipality to Alta Municipality in 6 hours. Alternatively, you can drive; or do a combination of taxi, ferry, and train. September in Alta Municipality sees daily highs of 13°C and lows of 6°C at night.